Todays Card Spotlight is on the pirate fish-man, Cloudrunner Marauder! Unfortunately, this will be the last Card Spotlight for a little over a week, as I am going away tomorrow and won't have access to my cards nor my computer. I'll try and make this up when I get back (about 9 days or so from now) by doing some extra Set 2 spotlights. Back to Set 1 today, where we have an often mentioned defensive card, the Aegis Citadel. Todays Set 2 Card Spotlight shines upon the truely monstrous Battle Master, a Biolith designed for the pure and simple purpose of tearing your creatures into tiny pieces. The rumours were true! 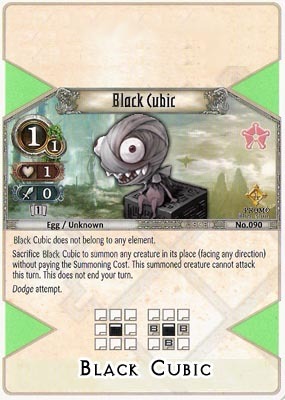 There is an Ultra-Rare Black Cubic Promo Card! It functions exactly the same as the White Cubic in the game, but the Black Cubic is just so much cooler. So, my Set 2 cards arrived sooner than I was expecting, and a lot of the cards in the set are extremely interesting. My first Set 2 spotlight is on the Shrine of Mourning, one of the cards that stood out the most as something with devestating potential. With Set 2 now available, I'll obviously be focusing on those cards more than Set 1. I'm aware that I still have a lot of Set 1 cards to get through though, so I won't be completely forgetting about them. I'm thinking of doing something like 2 Set 1 cards followed by a Set 1, then another 2 Set 2s etc. We'll see though.